Wayne's World is a platform game for the Sega Mega Drive, loosely based on the movie with the same name. It was only released in North America. 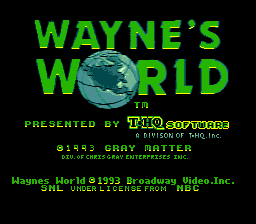 The game has the player control Wayne, who needs to save Garth. jumps, strums your guitar, firing a sound wave in the process. The four stages are loosely based on settings and themes of the film. Main article: Wayne's World/Magazine articles.